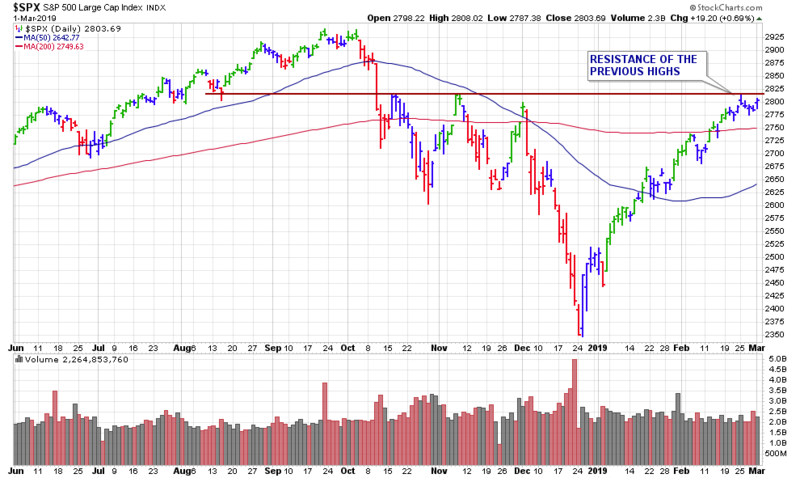 he 2019 rally continued for another week, although the Dow did close the week slightly off. The Dow Jones Industrial Average closed lower by just -0.1%, which was just enough to snap a nine-week winning streak, the longest weekly run since May of 1995. The Nasdaq closed higher for the 10th consecutive week, adding another +0.9% and remained above its 200-day moving average. It may now be facing some resistance of its previous highs/lows. For the week, the S&P 500 gained +0.4%, marked its first close above the psychologically 2,800 level since Nov. 8th. 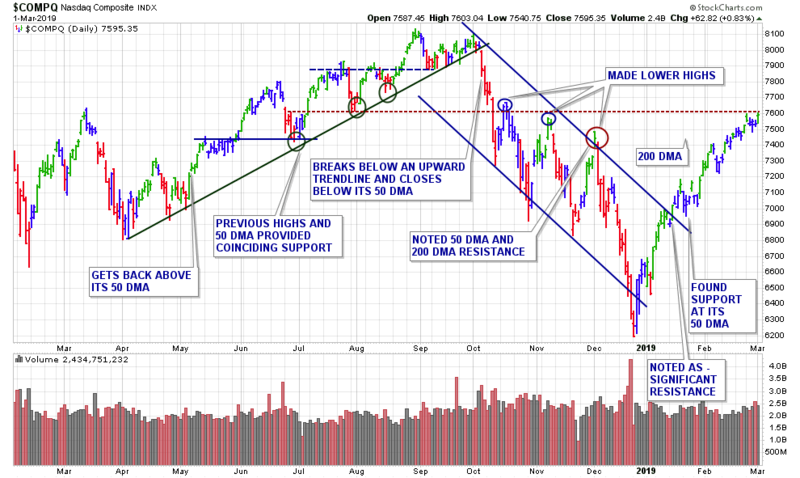 Pundits point out that level has proved a key point of resistance over the past several trading sessions. As I noted last week, 2815 is the previous highs and that level now deserves watching. 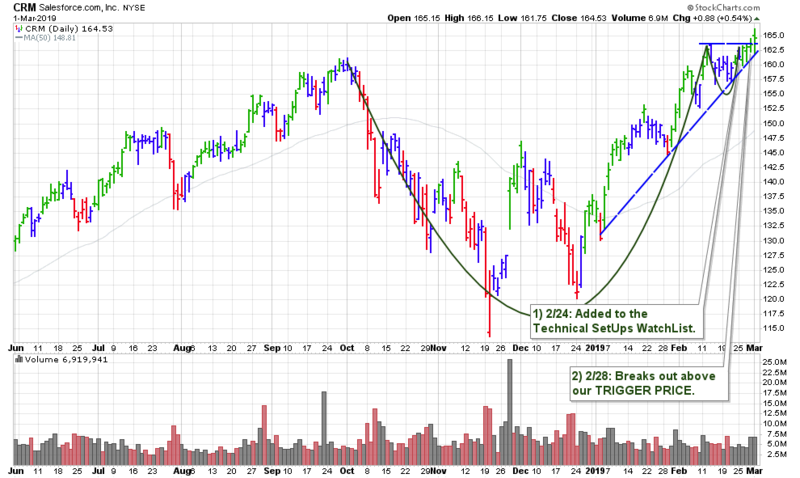 The market’s current rally-run has been impressive, but could possibly be starting to consolidate here. That would actually be ideal, considering the advance from the Christmas Eve lows. In the past 11 weeks, the Dow Jones Industrials and the S&P 500 have advanced +20%, while the Nasdaq Composite has jumped +25%. Regardless of market conditions, I am always preparing a watch list of high-ranked leaders which are building bullish technical bases. This week, I ran my routine stock screens and added 1 new stock to our weekly watch list. I’ll continue running screens all week. If anyone is looking for anything specific, long or short, please let me know. As of Sunday night, the Dow, Nasdaq, and S&P futures are up solidly on new reports that a trade deal with China is very close. This past week we had another 3 breakouts from our weekly watch list. 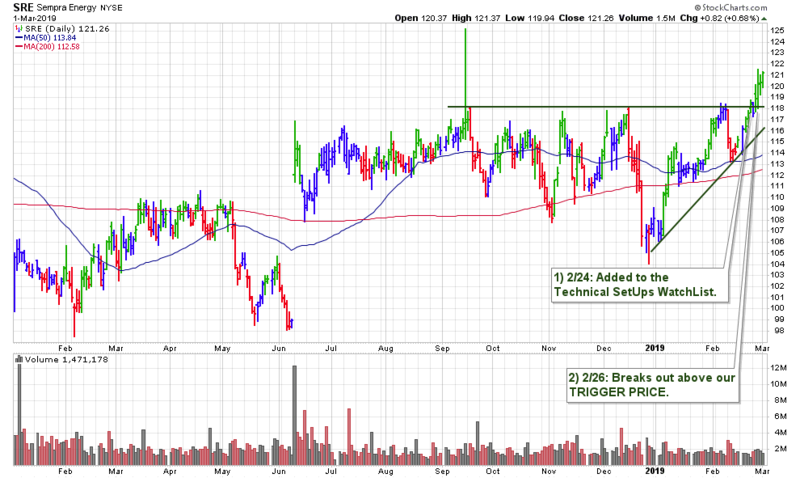 This leader just broke out of our watch list on Thursday with an +18% increase in volume. Shares opened strongly that morning, and traded above our TRIGGER PRICE of $163.67, yet then quickly sold off. By 10AM this stock was trading with a loss on its breakout day. From those early lows, shares traded to new highs at mid-day, then pulled back again to close the session two cents below the TRIGGER PRICE. There were some additional gains on Friday with the same +18% increase in turnover. We are going to put our 1st SUPPORT at the highs of the previous base, near $163.50. Below there we have the 50-day moving average for our next support, currently at $148.81 which is, however, unfortunately -10% below Friday’s close. What is of most importance is that this stock is going to report earnings on Tuesday afternoon. Investors should expect some volatility around the time of the announcement. This was an earnings breakout as the company reported Q4 2018 earnings before the open on Tuesday then shares cleared the TRIGGER PRICE later that afternoon. Volume was surprisingly only +8% above the normal daily rate. Usually, earnings breakout have a considerable increase in turnover. Shares continued higher each day for the remainder of the week. Going forward, we can put our 1st SUPPORT at the highs of the previous base, near $118.50. Our 2nd SUPPORT will be the coinciding 50- and 200-day moving averages, near $113.00. This selection was added to our watch list last Sunday and broke out first thing Monday morning, although volume was -25% normal rate. 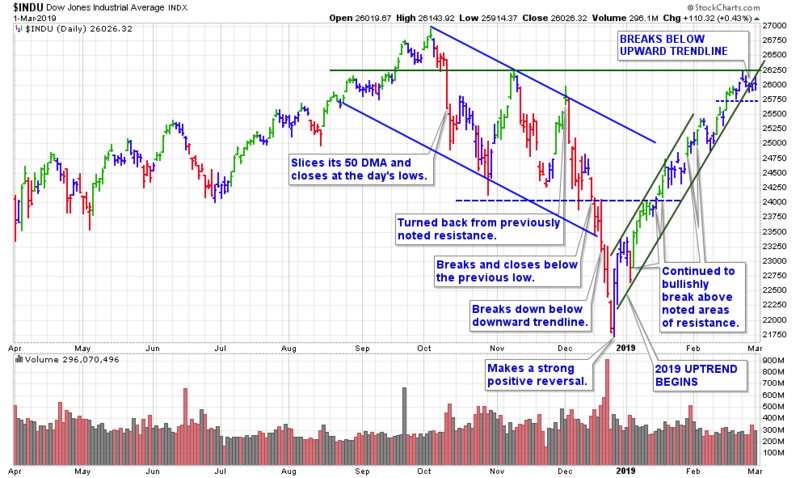 As we have seen, lower-volume breakouts have been working in this rally. Shares continued to trade higher for the rest of the week, making gains each day. Our 1st SUPPORT, in this case, is some previous highs near $252.00. 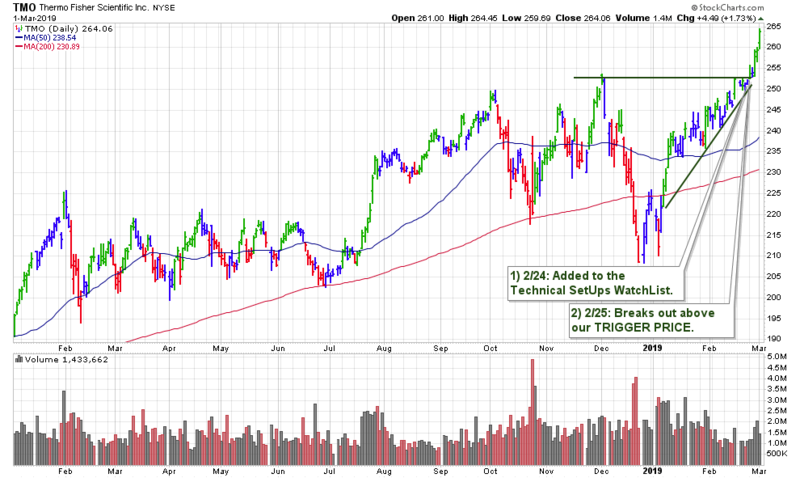 Support below there is not until the 50-day moving average at $238.54. Shares are current rather extended, so any considerable declines, especially with an increase in volume, would be your first concern.